Too often when you're out in the field, you'll be looking at a hillside and there are no outcrops of bedrock to tell you what's under it. An alternative is relying on float—isolated stones in the soil that you must assume came from the bedrock near by. Float is not reliable, but with care it can provide good information. An isolated stone is hard to rely on because once it's broken off, many different things can move it away from its original setting. Gravity pulls rocks downhill, turning bedrock into colluvium. Landslides carry them even farther. Then's there's bioturbation: Falling trees can pull up rocks with their roots, and gophers and other digging animals ("fossorial" animals is the official term) can push them around. On a much larger scale, glaciers are notorious for carrying rocks far from their origin and dropping them in big piles called moraines. In places like the northern United States and much of Canada, you can't trust any loose rock to be local. When you add water, there are new complications. 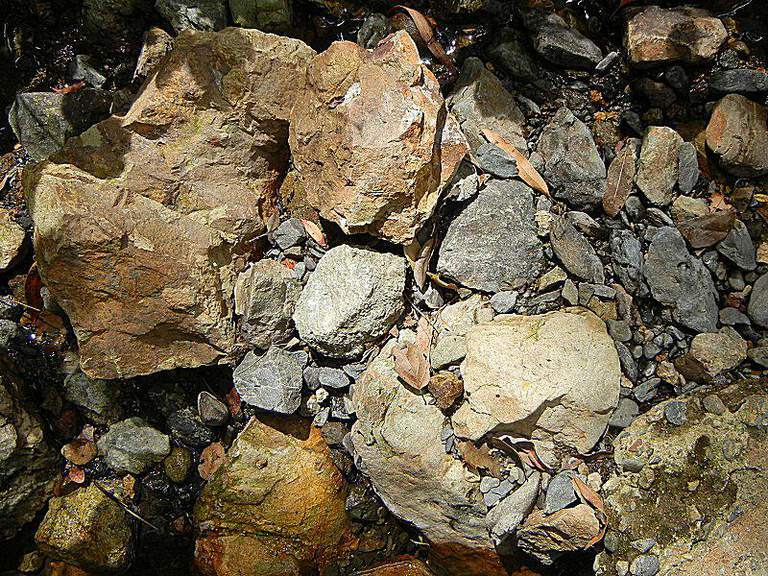 Streams transport rocks entirely away from their places of origin. Icebergs and ice floes can carry stones across open water to places they'd never reach on their own. Fortunately, rivers and glaciers usually leave distinctive signs—rounding and striations, respectively—on rocks, and they won't fool an experienced geologist. Float is no good for a lot of geology, because the original position of the rock is lost. That means that its bedding features and orientation can't be measured, or any other information that comes from the rock's context. But if conditions are reasonable, float can be a strong clue to the bedrock below it, even if you must still map the boundaries of that rock unit with dashed lines. If you're careful with float, it's better than nothing. Here's a spectacular example. A 2008 paper in Science tied two ancient continents together with the help of a small boulder found sitting on a glacial moraine in the Trans-Antarctic Mountains. The boulder, just 24 centimeters long, consisted of rapakivi granite, a very distinctive rock containing big balls of alkali feldspar with shells of plagioclase feldspar. A long series of rapakivi granites is scattered across North America in a wide belt of Proterozoic crust running from the Canadian Maritimes at one end to an abrupt cutoff in the Southwest. Where that belt continues is an important question because if you find the same rocks on another continent, it ties that continent to North America at a specific place and time when both were united in a supercontinent named Rodinia. Finding a chunk of rapakivi granite in the Trans-Antarctic Mountains, even just as float, is a key piece of evidence that the ancient supercontinent of Rodinia held Antarctica next to North America. The actual bedrock that it came from is underneath the Antarctic ice cap, but we know the behavior of the ice—and can confidently discount the other transport mechanisms listed above—well enough to cite it in a paper and make it the highlight of a press release.